Martin Brodeur brought a big name and a lot of media attention to St. Louis. The last time Brodeur faced off against the Predators, Brodeur recorded a shutout in 2013. However, his play against the Predators was less than stellar in the Blues 4-3 loss Thursday night. Brodeur allowed four goals on 24 shots in his first start for St. Louis. In the first period, Vladamir Tarasenko kept up his hot start as he stole the puck in the neutral zone and burst into the offensive zone. 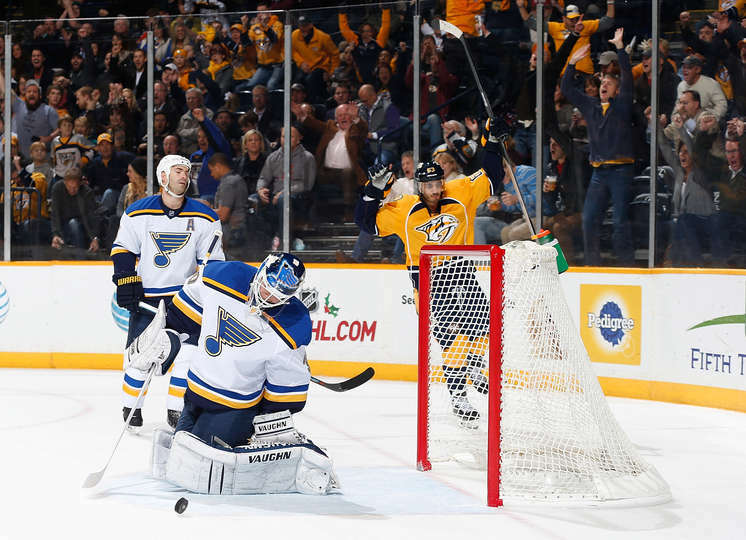 Tarasenko found Alexander Steen in the slot who gave a perfect one-touch pass back to, who beat Pekka Rinne to give the Blues a 1-0 lead with 14:14 remaining in the first period. The goal was Tarasenko’s 15th of the season, which leads the Blues this season. Brodeur performed well in the opening 15 minutes of the first period as he stopped all 12 shots he faced. However, the lead did not hold up as Jori Lehtera coughed the puck up in the defensive zone. Mike Rebeiro capitalized and fired the puck on net, and Filip Forsberg put the rebound past Brodeur for his 11th goal of the season to tie the game at one. Then with just under a minute remaining in the opening period, Eric Nystrom beat Brodeur off the feed from Ribeiro to give the Predators a one goal advantage headed into the first intermission. Ribeiro dished the pass to Nystrom who one-timed it into the back of then net making it 2-1. Coming out in the second period, Nashville did not skip a beat as Ribeiro racked up his third point of the day just 1:25 into the period. Forsberg also picked up his second point of the day and finished with a +1 on the day and league-leading +22 on the season. Then true to form, Tarasenko pulled the Blues within one with his second goal of the game with 16:09 left in the second. Right off the faceoff, Tarasenko took a slap shot that beat Rinne for the goal. Brodeur also played well in the rest of the second period as he did not let up another goal in the period keeping the Blues within one. In the third period, Jaden Schwartz pulled the Blues within one after a Predators goal by Colin Wilson in the middle of the third period. Schwartz’s goal was his ninth of the season, but it was not enough as Rinne made the necessary saves in the final minutes of the period to preserve the 4-3 win for Nashville. After the game, the Blues now sit at 16-8-2 with 34 points. The Blues are now two points being the division-leading Predators. St. Louis will take on the New York Islanders Saturday December 6th at 12:00 p.m. ET on the road. An amazing night for St. Louis sports!